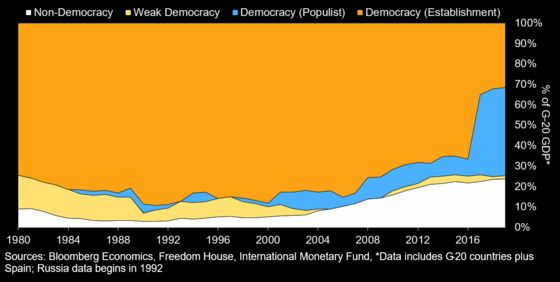 (Bloomberg) -- Almost 70 percent of the world’s most important economies is under the control of populist governments or non-democratic regimes, according to an analysis by Bloomberg Economics. The dramatic shift for Group of 20 nations -- from just 33 percent of their combined output in 2016 -- reflects in part the election of Donald Trump as president of the U.S. In 2018, the populist podium expanded to governments in Italy and Brazil. Over the longer term, a major factor has been the rise of China and the growth of its economy. The financial crisis accelerated the rise of a more extreme form of politics on both the left and the right, with voter anger over rising unemployment, austerity and inequality. The mood wasn’t helped by enormous bank bailouts seen as letting those to blame for the crisis off the hook. The change in political thinking is also affecting economic policies, and Bloomberg Economics says there are “increasing signs that bad policies are hurting growth.” BE’s new global GDP tracker puts growth at 2.1 percent in the first quarter, the slowest pace since the financial crisis. In addition to protectionism and the damage to global trade, one prime example is Italy, where the coalition sparked a bond sell-off over its approach to fiscal policy and the economy slipped back into recession. Other governments have taken notice of the political winds and what they see as a negative fallout on economies. France’s finance minister, Bruno Le Maire is using the country’s Group of Seven presidency to push the idea that major reform is needed. BE defines populist rulers as those “promising to defend the people against corrupt elites, offering common sense solutions versus complex policies, and advocating national unity over cosmopolitan inclusion or international engagement.” Based on that definition, it puts Brazil, India, Italy, Mexico, Turkey and the U.S. in that camp. Under the Freedom House classifications, China, Russia and Saudi Arabia are in the non-democratic category.